A couple flips of the pan and these sauteed baby carrots will land right in the plate next to your main dish. 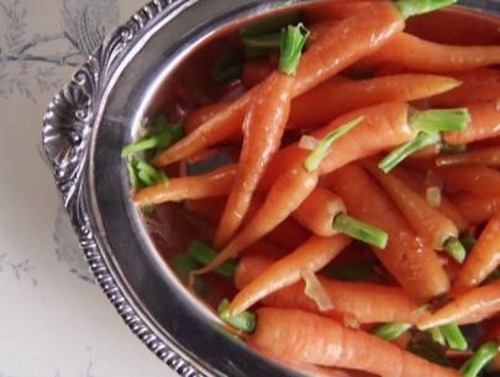 These sweet little candied carrots are great served with any kind of meat or fish. Adding a little butter and brown sugar to the carrots almost guarantees the kids will love them. I love sautéing them with long green onions or shallots to give them a little added flavor. Clean and peel the carrots leaving the green leafy tops. Par boil the carrots for 5 minutes. In a small frying pan sauté onions in the oil and butter for 2 minutes. Add carrots and sauté another 2 minutes. Sprinkle with brown sugar and cook another minute. Plate and sprinkle with chopped parsley.